provides correctional services to the people of Vanuatu. "Sefti, digniti, rispek mo gud fasin blong evriwan"
The Department works with chiefs, churches and communities to develop safer and more harmonious communities throughout Vanuatu. The Department delivers custodial sentence management via Correctional Centres and community based sentence management via the Probation Service. It manages around 230 detainees within four Correctional Centres and more than 400 offenders in communities throughout Vanuatu. 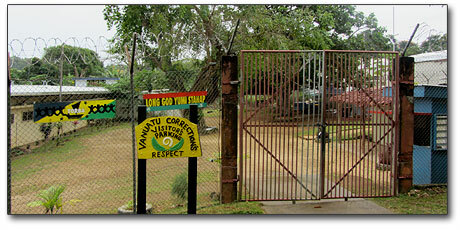 Welcome to the Vanuatu Department of Corrections website. It is our intention to regularly update this site with information regarding our Department, important events, new research and reports regarding Correctional Services in Vanuatu.